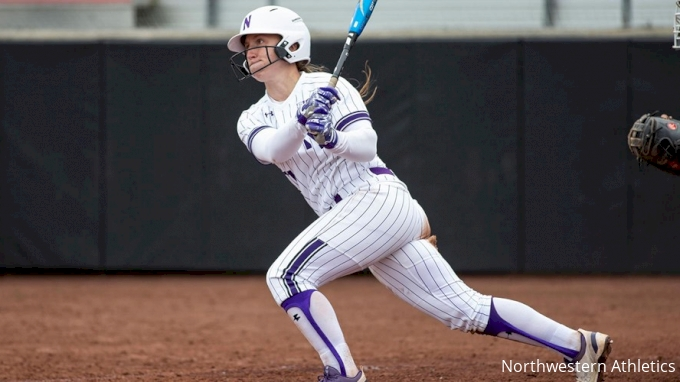 Northwestern continued to dominate Big Ten competitions as took both games of a doubleheader on Saturday to complete a three-game series sweep over No. 25 Wisconsin. In game two, the Wildcats fell behind one in the top of the third but wasted no time taking the lead away from the Badgers. After a Skyler Shellmyer walk, Rachel Lewis sent another ball into the right-field bleachers to give Northwestern a 2-1 lead. The runs kept coming in the third after a Morgan Nelson walk, Maeve Nelson hit a moonshot on to the roof of Welsh-Ryan arena to increase the lead to three. Nelson is now the second Wildcat this season to join the prestigious Welsh-Ryan Arena "Roof Club", with Rachel Lewis having done so earlier in the season. She is just the eighth different NU player to hit a ball onto the roof in the 34-year history of Sharon J. Drysdale Field. Wisconsin clawed their way back into the game, tying it at 4-4, but Northwestern's stellar defense and pitching never let the Badgers score more than one run in an inning. Williams went the distance, throwing all 10 frames and earning her 21st win of the season. She tallied 12 strikeouts along the way, making this her 8th game this season with double-digit strikeouts. Novak led off the bottom of the 10th and rocketed a pitch over the left field fence for her third homer and 20th RBI of the season. Chicago's Big Ten Team is back in action this weekend with a three-game series against Purdue at Sharon J. Drysdale Field. First pitch is scheduled for Friday at 4 p.m. CT.